Susan Williams-Ellis was one of the most celebrated British designers of the second half of the 20th century, the co-founder of Portmeirion Potteries and the creator of that company’s hugely popular Botanic Garden range of tableware. At the time of her death in 2007, it was calculated that that range alone had accounted for worldwide sales of $450 million in its 35 years of existence, while Portmeirion was, as the Daily Telegraph’s obituary pointed out, now ‘one of the world’s most successful ceramics companies’. And within her own lifetime, the Guardian was referring to the Potteries in the same breath as firms that had been in existence for centuries: ‘the great British potteries, such as Denby, Wedgwood and Portmeirion’. The extraordinary success story of the Potteries, however, represented only one facet of Susan’s life and work. Indeed she was already in her mid-50s when she launched the Botanic Garden range, with a career that stretched back to the days before the Second World War: her first book had been published when she was still in her teens; panels she had painted had been exhibited at the Festival of Britain; and her textile designs had appeared everywhere from Portmeirion Village to the SS Canberra – all this before she started the company that was to make her famous. 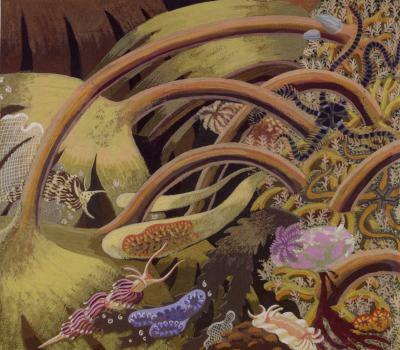 And running throughout Susan’s long life was a fascination with the world of the sea, an obsession that led in 2002 to her first exhibition as a painter, and to an acclaimed BBC documentary made by Helen Williams-Ellis. ‘I just think that underwater is a much more interesting place than on land,’ she explained. It is this interest in marine life that is celebrated in Magic Gardens. 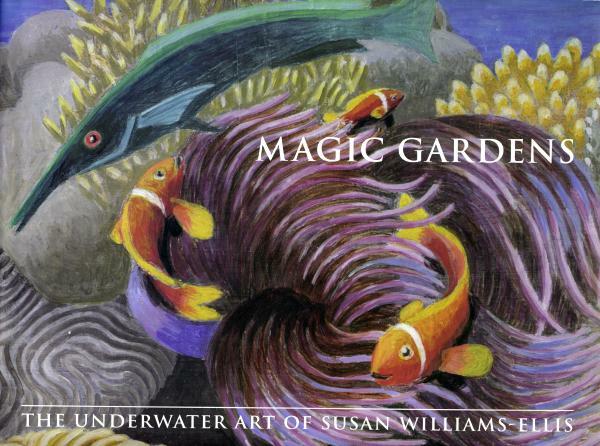 Susan had long wished to produce a book of her underwater art, a project that remained unfulfilled at her death in November 2007. 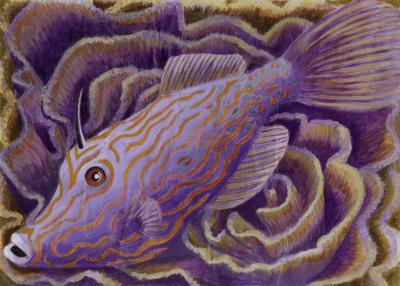 The series of pictures of tropical fish that form the centrepiece of the book began in the mid-1970s, at the height of the success of Portmeirion Potteries, and continued through to the end of the century. Well into her eighties, she was still travelling the world, in the company of her husband Euan Cooper-Willis, still snorkelling with drawing-pad in one hand, china pencil in the other, sketching the world beneath the waves. Also included is a selection of rare works from the early years of Susan's career that reflect her longstanding interest in sea-life. 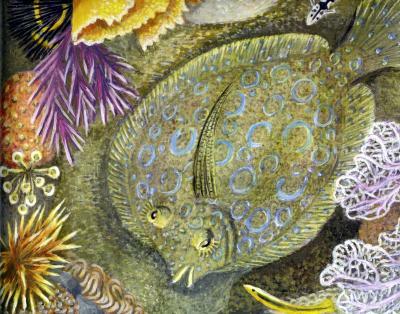 In the 1940s and 1950s she was commissioned to produce illustrations for two books: the first for Puffin to be entitled Shore Life in Britain (co-written with Richard Elmhirst), and the second for Sidgwick & Jackson with the provisional title The Compleat Mermaid: A Quick Book for the Underwater Naturalist in British Seas. In the event, neither of these books were published and, though some of the paintings she made for them did appear elsewhere, many others have remained unseen until now. Published on the first anniversary of Susan's death, Magic Gardens is intended to pay tribute to the long and remarkable career of one of Britain's best-loved designers.